Autumn may bring mixed fortunes but the weather on the final Sunday in September was generally good although a little chilly at the start of the Lancaster CTC ride in Scotforth. The day’s ride was to Light Ash Farm, near Myerscough and then on to Calder Vale School where the harvest celebrations provided a chance to sample some of the village produce. The ride out to coffee was via Cockerham, Garstang, Nateby, Moss Edge and Cartford before turning towards St Michaels on Wyre. Apart from a stiff breeze when heading west it was a relatively easy ride out. During the first 16 miles they saw a large number of riders in a sportif event riding with somewhat more urgency on their allotted course. After St Michael’s the ride headed south and then east towards Light Ash Farm for the coffee break. After a long delay the ride continued, initially past Myerscough College and across the A6 at Bilsborough, before heading down to Duckett’s Farm and Claughton on Brock en route to Sandholme Bridge. 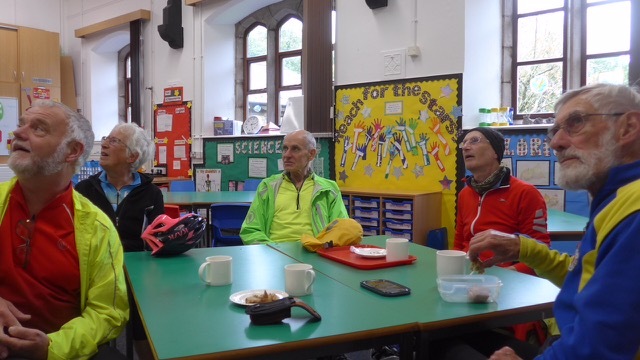 The next section took the riders up the long climb of Bell Lane and Strickens Lane after which some riders headed directly into Calder Vale village before walking through the wooded pathway up to the church and school. The rest continued towards Oakenclough and then turned right climbing up Calder Bank and on to the school. Here they had welcome refreshments. The ride then continued over Harrisend Fell and the Fleece before Galgate and the university cyclepath back into Scotforth. The ride has been just over 40 miles long and had been on distinctly varied terrain from the relatively flat roads of the Fylde and the rather more challenging roads on the edge of the Bowland fells. The ride next Sunday, October 7th, will be led by the club chairman, and is to Arnside.